You are currently browsing the archives for the Free Markets category. The problem is, experts say, the odds are stacked against a city this size to find another airline interested in providing service. St. Cloud is not alone. “When smaller airports lie in the shadow of a much larger airport, they’re finding it increasingly difficult to attract and retain air service, and St. Cloud certainly fits that mold,” said William Swelbar, research engineer in the Massachusetts Institute of Technology’s International Center for Air Transportation and an airline industry analyst. Albert Einstein famously said that doing the same thing again and again and expecting different results is the definition of insanity. That’s the cycle St. Cloud is repeating. I know Mayor Kleis wants to attract another airline to St. Cloud. He’s fighting a valiant fight. He’s expended tons of energy trying to make that a reality. “I don’t know of any community in America that has tried harder and had more civic commitment to make this work,” said Michael Boyd, president of Colorado-based aviation consulting firm Boyd Group International. “You did the best you can, and now you’ve learned. There is no other airline.” For St. Cloud residents seeking access to the rest of the world, “your airport is Minneapolis. That’s not going to change,” Boyd said. Mayor Kleis is trying to get the legislature to loan the City $2,000,000 to attract another airline. There’s little enthusiasm on either side of the aisle for that type of loan. 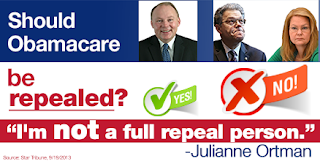 Even if there was, it would be a terrible deal for Minnesota taxpayers and St. Cloud taxpayers. There’s virtually no chance that a different airline will come to St. Cloud. If one came, the odds that they’d stay after the loan dried up would be tiny, if not officially nonexistent. What Mayor Kleis hasn’t admitted yet is that there isn’t a market for what he’s pushing. The question Mayor Kleis needs to ask himself is why he thinks thing would be different this time. If he won’t ask that question before asking for $2,000,000 that he’d need to repay, then perhaps it’s time that the legislature simply said no. It’s time to admit that this priority won’t become a reality. But what about Gov. Dayton, who spent millions and millions of his own money to win a U.S. Senate seat? “That’s different. He spent his whole professional life in public service to make the state better. I’m not saying there is a huge difference in their background … just their approach,” Martin said. That’s rather revealing. Apparently, the DFL thinks that a rich career politician made Minnesota better but a guy whose family owns a profitable business, who worked his way up through the business, who started as a janitor and who’s helped create hundreds of good-paying jobs hasn’t made Minnesota better. The thought that public service is honorable but creating private sector jobs isn’t honorable is startling and troubling. If anything, I’d argue that the person creating private sector jobs is improving Minnesota and that a career politician is someone totally out of touch with the people. Career politicians have spent years listening to lobbyists who want their vote on their bill. They’ve spent years listening to their political consultants who stress staying on message rather than listening to the people. By comparison, successful entrepreneurs spend their time listening to the people they want to sell their product to. If they don’t listen to their customers, they don’t make a profit. Then they go out of business. Dayton implemented MNsure, which doesn’t work. It cost $160,000,000 to build a website that still isn’t working. Despite its failure, Dayton’s financial health hasn’t suffered one iota. That’s right. There aren’t any consequences for Dayton when his policies fail because it isn’t his money that’s getting spent. Why would he care if his policies fail? Let’s compare that with Stewart Mills. If Stewart Mills’ business decisions aren’t wise, the company doesn’t make a profit. If that continues long enough, the company files for bankruptcy and real people lose their jobs. An entrepreneur must listen to the people to make a profit. A politician just needs a political machine to keep making mistake after mistake. That machine isn’t complete without an apologist like DFL Chairman Martin. And what of Democratic Minnesota U.S. Sen. Al Franken, who is also now a millionaire with money accumulated as a comedian, actor, author and small businessman, and holds big-buck fundraisers with Hollywood celebrities? “He understands working class Minnesota. Franken was not born into that money. Mills was born on third base and thought he hit a triple,” Martin said. Martin then tempered his remarks to say his criticism was not against people achieving wealth. “If you attack wealth, you’re attacking the American Dream. I don’t want this to come off that I’m attacking that. It’s about what you do with it and want to do with it. I just don’t understand what his (Mills) motivation is to run … how he can relate to working class Minnesotans,” Martin said. Thankfully, Martin isn’t attacking wealth. That’d be un-American. Gov. Mark Dayton says a key provider’s decision to drop out of the state-run health exchange is competition in action. Gov. Dayton either doesn’t understand free market capitalism or he’s doing his best to hide the fact that MNsure is a failure. The other possibility is that he’s hiding the fact that MNsure is a failure and he doesn’t understand free market capitalism. “Our MNsure individual product membership is only a small percentage of the entire PreferredOne enrollment but is taking a significant amount of our resources to support administratively,” a company statement says. Competition didn’t drive PreferredOne from the market. MNsure’s administrative requirements drove PreferredOne’s decision. PreferredOne’s decision was also driven by the fact that government regulations made it virtually impossible for them to make a profit. Why would a company volunteer to do tons of work and not get paid for that work? Dayton says the company gained market share due to its low rates. PreferredOne dropped out because it’s impossible to continue to offer those low rates. That means rates will increase this fall. She is running and has racked up an impressive series of endorsements. She has been endorsed by our friends at Tea Party Express, the Conservative Campaign Committee, Citizens United and most recently she was endorsed by Sarah Palin. She is pro-life, pro-Second Amendment, pro-low taxes and perhaps most importantly in favor of a complete repeal of Obamacare. But let’s be honest, 15% should be more than enough interest in an economy when banks can borrow at the federal funds rate (0.25%), and the prime lending rate hovers at 3%. Who made Ms. Ortman the arbiter of free markets? The TEA Party activists I know and agree with would recoil if they heard Ms. Ortman’s statement. Andy Parrish can brag about the endorsements but what he can’t do is honestly say that his candidate is a principled conservative. That’s because she isn’t a conservative. She’s a career politician with a moderate bent. @LFRGary If I had a nickel for every time a liberal told us we were losing credibility, we’d be rich. If I had $1,000,000 for each time someone called me a liberal, I’d be worth $1,000,000. Apparently, TPN isn’t interested in doing their homework. Calling me a liberal, which is what they just did, just isn’t credible. If TEA Party Nation had done their homework, they’d know I’m a rock solid conservative. Then again, if they’d done their homework and if they were intellectually honest, they’d know that Julianne Ortman selectively believes in free markets and low taxes. TEA Party Nation is a high profile organization. In this instance, however, they aren’t intellectually honest. I just started watching Almanac’s Roundtable but I had to stop and write about what panelists Heather Carlson, Mary Lahammer and Tom Scheck said. Frankly, what they said is insulting. They’re disgraces to the reporting profession because they aren’t telling the whole truth. These aren’t tax cuts. A tax cut is when you lower the rate at which something is getting taxed. For instance, if income is getting taxed at 7.85% by the state, a tax cut would be lowering that rate. If farm equipment repairs aren’t subject to Minnesota’s sales tax, then the legislature passes their a bill that subjects farm equipment repairs to the state’s sales tax, then the legislature repeals the sales tax on farm equipment repairs, that isn’t a tax cut. That’s returning things to where they were before the DFL legislature waged war on taxpayers. Another key portion of the Tax Correction Bill is tax conformity. That saves Minnesotans money but tax conformity is something that’s typically the first bill passed each year. The truth is that the DFL raised taxes because Sen. Bakk insisted on punishing farmers, telecommunication companies and warehousing businesses. That’s where those B2B sales taxes came from. The truth is that the DFL raised other regressive taxes last year, too. Now they’re trying to portray themselves as tax cutters when they’re really admitting that they raised taxes too much last year. What’s disappointing is that media personalities like Carlson, Lahammer and Scheck are playing along with the DFL’s storyline. It’s disappointing from the perspective that societies that don’t get the whole truth make difficult decisions based on incomplete or faulty information. That’s a recipe for disaster. It’s also why the MSM is held in such low regard. If Scheck, Lahammer and Carlson want to be DFL shills, that’s their right. In that case, however, taxpayers should insist that funding for TPT and MPR be cut dramatically because taxpayers shouldn’t pay for the DFL’s operations. If MPR and TPT can’t make it without taxpayer funding, that’s tough. That’s called the marketplace working perfectly. The notion that MPR and TPT are the only real reporting outlets because they aren’t owned by corporate interests is insulting. They’re just as biased as Esme Murphy or Lori Sturdevant. It’s time Minnesotans raised hell on this. They’re getting cheated by DFL spinmeisters pretending to be reporters. These reporters bought the DFL’s storyline without hesitation. A reporter’s job is to question people in authority. Carlson, Lahammer and Scheck apparently don’t think that’s part of their responsibility. I don’t know whether Sen. Ortman is honestly against repealing Obamacare or if she’s simply pandering to moderate voters. What I’m certain of is that Sen. Ortman’s statements aren’t winning her votes with GOP delegates. I know that because the vast majority of delegates to the GOP State Convention hate the Affordable Care Act with a passion. Further, they understand that it’s impossible to fix a couple parts of the bill without throwing other parts of the bill totally out of whack. Finally, they know that sounding like Al Franken won’t help Republicans defeat Franken. America’s health care system is broken, but Obamacare is not the answer. Before we can make the kind of changes Americans deserve, we need to repeal the “Unaffordable Care Act” and replace it with a patient-centered, market-based solution that will lower costs and increase accessibility for all Americans. Minnesota has some of the best health care minds in the entire world. Instead of looking to bureaucrats in Washington, we can take charge and develop homegrown solutions for health care. By restoring power to the states, we can free Minnesota to become a laboratory for innovation and a standard-bearer for health care solutions that work. That’s the type of strong statement it’ll take to defeat Al Franken. Mr. McFadden would put physicians and families in charge of their health insurance. It wouldn’t let the federal government dictate to families. I’ve met Sen. Ortman. She’s an honorable public servant. Unfortunately, she’s wrong on this issue. To defeat a well-funded Democrat incumbent, Republicans can’t afford to make this type of major mistake. There doesn’t seem to be any other large company trying to do this so it might as well be us. Somebody has got to work to save the country and preserve a system of opportunity. I think one of the biggest problems we have in the country is this rampant cronyism where all these large companies are into smash and grab, short-term profits, (saying) how do I get a regulation, we don’t want to export natural gas because of my raw materials. Well, you say you believe in free markets, but by your actions, you obviously don’t. You believe in cronyism. And that’s true even at the local level. I mean, how does somebody get started if you have to pay $100,000 or $300,000 to get a medallion to drive a taxi cab? You have to go to school for two years to be a hairdresser. You name it, in every industry we have this. The successful companies try to keep the new entrants down. Now that’s great for a company like ours. We make more money that way because we have less competition and less innovation. But for the country as a whole, it’s horrible. And for disadvantaged people trying to get started, it’s unconscionable in my view. I think it’s in our long-term interest, in every American’s long-term interest, to fight against this cronyism. As you all have heard me say, the role of business is to create products that make peoples’ lives better while using less resources to do it and making more resources available to satisfy other needs. When a company is not being guided by the products they make and what the customers need, but by how they can manipulate the system, get regulations on their competitors, or mandates on using their products, or eliminating foreign competition, it just lowers the overall standard of living and hurts the disadvantaged the most. We end up with a two-tier system. Those that have, have welfare for the rich. The poor, OK, you have welfare, but you’ve condemned them to a lifetime of dependency and hopelessness. Yeah, we want hope and change, but we want people to have the hope that they can advance on their own merits, rather than the hope that somebody gives them something. That’s better than starving to death, but that, I think, is going to wreck the country. Is it in our business interest? I think it’s in all our long-term interests. It’s not in our short-term interest. And it’s about making money honorably. People should only profit to the extent they make other people’s lives better. You should profit because you created a better restaurant and people enjoyed going to it. You didn’t force them to go, you don’t have a mandate that you have to go to my restaurant on Tuesdays and Wednesdays or you go to prison. I mean, come on. You feel good about that? In my estimation, that’s the definition of American patriotism. Capitalism and innovation being used to make the United States the greatest nation on the face of the earth is the definition of patriotism. When companies makes money because their lobbyists get the government to build roadblocks in front of the competitors, that’s crony capitalism, which hurts the American economy overall. When companies’ profits increase because they’ve built a product that improves people’s lives, that’s competitive capitalism. That type of capitalism is the type of capitalism that strengthens the economy while improving people’s lives. People that put the long-term health of the nation ahead of short-term profits and personal gain are patriots. That isn’t to say short-term profits are automatically evil. In many instances, they aren’t. It’s that building products that create profits now and long into the future has a stabilizing effect on a nation’s health. That’s the definition of patriotism. That’s what Sen. Reid apparently doesn’t understand. This simply won’t cut it. Obamacare, aka the ACA, is a gigantic failure that should be scrapped and replaced with something that limits governmental ‘participation’. Preferably, the replacement bill should permit families and their physicians to determine what coverages they need or don’t need. As conservatives, the first thing we need is to admit that the ACA isn’t fixable. If we think that it’s fixable, then the only path forward is tinkering around the edges. That won’t work. What’s needed is a replacement plan that’s patient-centered, a plan that lets families and the physicians they know and trust choose what’s best for the families. Anything that tinkers around the edges is defeatist thinking. I don’t accept the premise that the ACA is fixable because it’s exceptionally complex. For instance, if you think that government shouldn’t be in the business of telling families what coverages their health insurance policies must include, then catastrophic policies must be offered. The problem with that fix is that that totally messes up Obamacare’s funding mechanism. That means Obamacare a) isn’t sustainable financially and b) doesn’t put families in charge of their health insurance. That isn’t acceptable. But repealing the law would strip Americans of this new freedom and take us back to the days when big insurance companies had the power to decide what care residents of Minnesota could receive-allowing them to once again deny coverage to children with pre-existing conditions, cancel coverage when people get sick, and place limits on the amount of care people can get, even if they need it. What’s more, without the law, insurance companies could overcharge for insurance just to boost their profits, or use fine print to deny medical treatments that are covered under people’s policies. Ask people who can’t keep the policies they bought and liked because Washington, DC said they knew what’s best for families if they like their new options. Across the nation, people are telling their horror stories. If Sen. Ortman agrees with Sen. Franken that repealing Obamacare isn’t the right thing, then she’s sending the wrong message to Minnesotans. The biggest factor in reaching those goals is to get young people without insurance to enroll. That’s not happening. Plus, implementation of the ACA caused countless people with insurance to either lose their policies, pay substantially more for them, or pay more for different coverage. Lawmakers need to fix those problems. If polling is any indicator, that could happen by revising the ACA to do something such as allowing insurers to provide policies that are less expensive but come with higher deductibles. First, I’ll stipulate that offering catastrophic plans would destroy the Anything But Affordable Care Act because it would irreparably harm the insurance companies. Next, I’ll stipulate that selling catastrophic plans would require eliminating the essential health benefits provisions of the bill. President Obama, Sen. Reid and Nancy Pelosi would rather wear snow shoes while walking through a mine field than repealing the ABACA’s essential health benefits provisions. The exposure of MNsure’s endless problems the past three months speaks to the importance of government officials and private vendors being accountable. As Minnesotans have seen, both sides are blaming each other for a laundry list of technical problems with the site. A consultant last week even recommended scrapping it. While I agree that accountability is essential, that isn’t as important as old-fashioned competence. It’s indisputable that Gov. Dayton, the MNsure board of directors and the DFL co-chairs of the MNsure Legislative Oversight Committee didn’t pay attention. Similarly, while it’s true that the DFL smear machine have blamed Republicans for MNsure’s failures, that doesn’t mean the DFL’s claims have merit. That’s like blaming Republicans for raising income taxes last year. That’s like blaming Republicans for creating the warehousing services sales tax and the farm equipment repair sales tax. Those accusations are outright lies, which is what ABM specializes in. Further, it’d be nice if the Times grew a spine. While it’s true the DFL is blaming Republicans for MNsure’s failures, it isn’t too much to ask the Times’ editorial board to say that the DFL’s accusations are without merit. While it might be possible to eliminate the counterproductive provisions from the ABACA, it’s better to repeal it and replace it with a system that puts families, not distant, out-of-touch bureaucrats, in charge of their health insurance and health care. It’s better to let families and their physicians determine which coverages they need. Finally, it’s best if families determined which policies best fit their families’ health care needs and their budget. That’s something Washington, DC can’t do.